American lady butterfly on blazing star (Liatris ligulistylus). Photo by Debbie Roos. Wednesday, August 8 at 5:30 p.m.
Tuesday, August 14 at 10:00 a.m.
And so you can plan ahead, I’ll be doing tours on September 5 at 5:30 p.m. and September 13 at 10:00 a.m. Click here to view the 2018 Pollinator Garden Tour Schedule. No registration is required…just meet on the lawn in front of Chatham Marketplace a few minutes before the start of the tour, rain or shine! The garden is looking great and has over 60 different species in bloom this week. 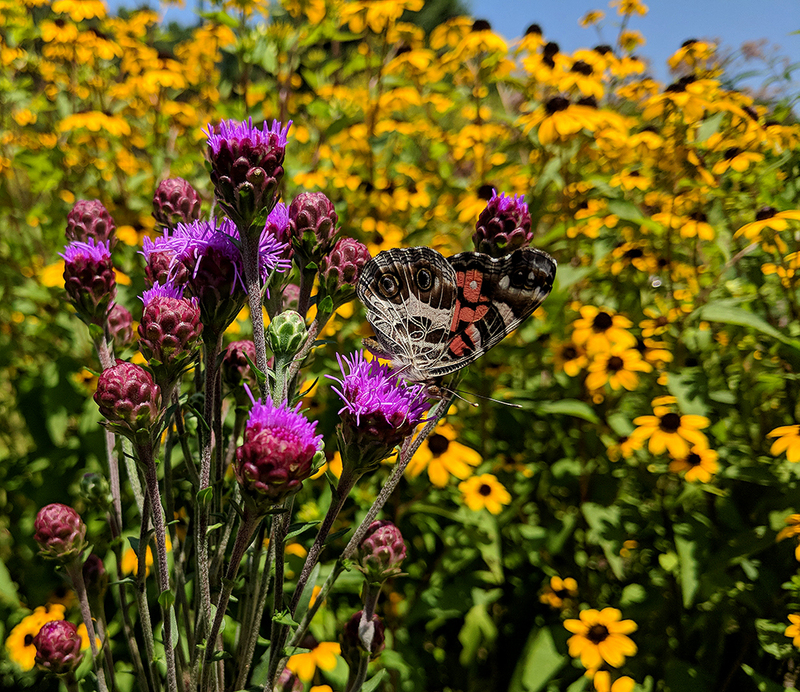 View the 2018 Pollinator Garden Tour Schedule for other tour opportunities through the end of the year. • Two Pollinator Garden Tours in October!